More than 100 Muslim women are calling for a real European model of inclusion and pluralism giving everyone access to employment and education while not placing an extra burden on women. 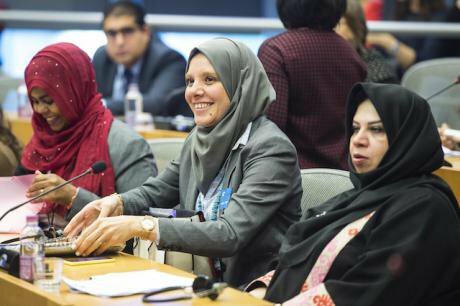 Participants at a conference on 'Islam and Women' at European Parliament headquarters in Brussels, Belgium, November 2017. Wiktor Dabkowski/Press Association. All rights reserved. Recently, for the first time, the women’s rights committee of the European Parliament discussed the situation of Muslim women in Europe, including dress restrictions and how recent developments have undermined women’s rights. A collective of more than 100 Muslim women are responding by calling for a real European model of inclusion and pluralism that ensures everyone can have access to employment and education and that doesn’t place an extra burden on women. According to a recent report by the Open Society Justice Initiative, nearly one in three EU member states have placed legal restrictions on Muslim women’s dress at either local or national level. In addition, bans on headscarves and other Muslim women’s dress by both businesses and public institutions have been increasingly reported in nearly half of the EU countries. This has resulted in preventing these women from accessing jobs. How can this be seriously reconciled with EU principles of non-discrimination and gender equality? However, there is hope for an inclusive Europe as in most countries, proposals for legal bans have been rejected either by legislators or by the courts. This means that there are many people fighting back against attempts to stigmatise and discriminate against Muslim women, including strong civil society campaigns. This is all the more important as analysis shows that many of these bans on religious dress, although framed as though they apply to all religious groups equally, in fact clearly and visibly target Muslim women. Indeed, restrictions are often adopted after heated debates on Muslim women’s dress and the presence of Muslims in Europe. The ‘neutrality’ argument is used frequently only as an attempt to legally discriminate against Muslim women. In addition, many far-right parties are increasingly pushing for these bans, using Islamophobic discourses. While neutrality remains a key principle for our societies, we cannot disconnect its current usage and restrictive policies from the context of generalised suspicion against Muslims, the disproportionate impact of these restrictions on women and the structural dimension of exclusion which has an impact on other areas of life and on how society perceives Muslim women. It is crucial to be politically bold and embrace diversity by ensuring that all can contribute to our societies with their multiple identities. Inclusive and positive approaches need to be chosen over exclusion and limitations on fundamental rights. This will be a powerful way to counter the most xenophobic parties gaining power in several European countries. It is crucial to be politically bold and embrace diversity… a powerful way to counter the most xenophobic parties gaining power in several European countries. There are already many positive examples of both private and public employers that have made the choice of inclusion and that are increasingly influencing policy and legal developments in different EU countries. We hope countries and private entities which have adopted a restrictive approach will now follow suit. EU member states should assess the specific effects of rules on religious dress in public and private institutions on Muslim women. They should also ensure that practices and policies promote fully inclusive workplaces, places of education and public spaces, including by rejecting any new proposals to ban religious clothing in employment and institutions. Why has it been so hard so far to choose inclusion over exclusion in support of women’s emancipation? In the face of the worrying situation of exclusion targeting a specific group of women in Europe, the European Parliament’s discussion supports the broader feminist solidarity with Muslim women that is gaining ground in Europe. At a time when Muslim women are also victims of violent sexist and racist attacks, we need to acknowledge that the structural discrimination they experience is feeding into racism and sexism.